Software design for high performance computing. 3D visualization of scientific data. Morphology of New Zealand endemic ferns. Modeling Calcium Waves in an Anatomically Accurate Three-Dimensional Parotid Acinar Cell. Journal of Theoretical Biology, May 2016, ISSN 0022-5193. Rugis, J.: An HPC Implementation of the Finite Element Method. February 2016, Queenstown, New Zealand. Rugis, J.: Realistic 3D Cell Modeling for FEM Simulation. November 2015, Auckland, New Zealand. Sneyd, J., D. Yule and J. Rugis: Multi-Scale Modelling of Saliva Secretion. December 2014, Auckland, New Zealand. Rugis, J. and J. Sneyd: A Multi-Scale Model of Saliva Secretion. July 2014, University of Waikato, New Zealand. Geocritical Reservoir Flow Simulation and Display using Open Porous Medium (OPM) Code. November 2013, Rotorua, New Zealand. Rugis, J.: An MPI + GPU Implementation Case Study. July 2013, University of Canterbury, New Zealand. Montserrat geothermal system: A 3D conceptual model. Geophysical Research Letters, Volume 40, Issue 10, pp. 2038-2043, May 2013. Rugis, J.: Interactive Large-Data Modeling and Visualisation. CITR Seminar, University of Auckland, February 14, 2013. Rugis, J. and P. Leary: Towards Crustal Reservoir Flow Structure Modelling. November 2011, University of Auckland, New Zealand. Rugis, J.: Visualizing 3D Geophysical Data. CITR Seminar, University of Auckland, October 27, 2011. Rugis, J.: A Fern Propagation Report. Auckland Botanical Society Journal, Vol 65(1), pp. 78-82, June 2010. 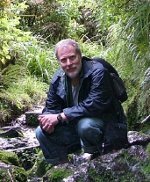 Rugis, J.: A Native Fern Survey Report. Wairua Lodge, Whitianga, Coromandel Peninsula, February 2, 2009. Rugis, J.: Digital Surface Curvature: Identifying and Visualizing Surface Detail. Rugis, J.: Native Fern Propagation. August 2008, Auckland, New Zealand. Rugis, J.: Digital Surface Curvature. PhD Thesis. University of Auckland, 2008. 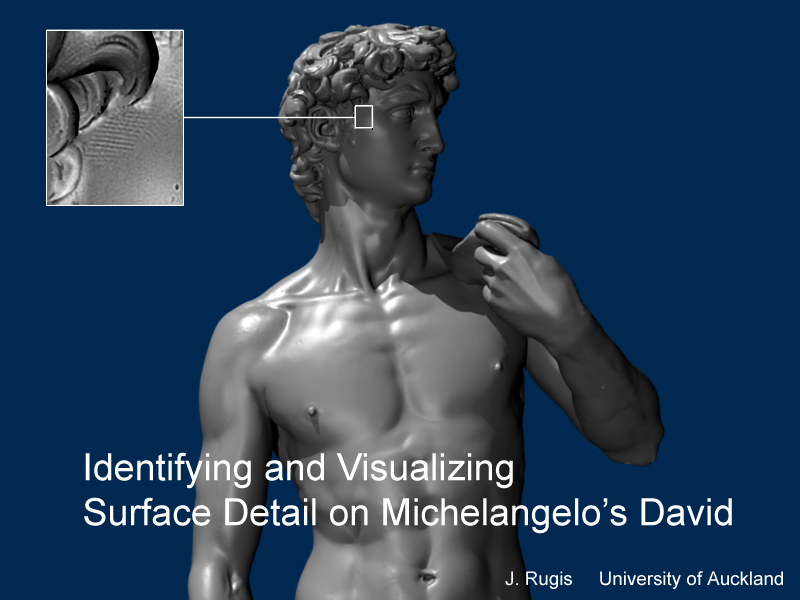 Rugis, J.: Identifying and visualizing surface detail on Michelangelo's David. Conference DVD-ROM, 2007. San Diego, USA. 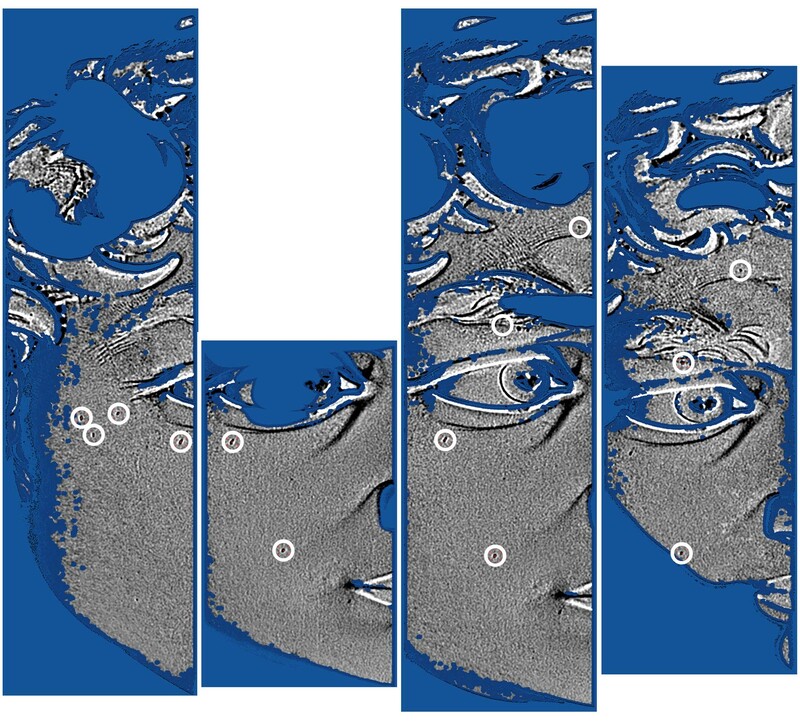 Surface curvature extraction for 3D image analysis or surface rendering. Rugis, J.: An exploration of a bijective mapping in the integers. 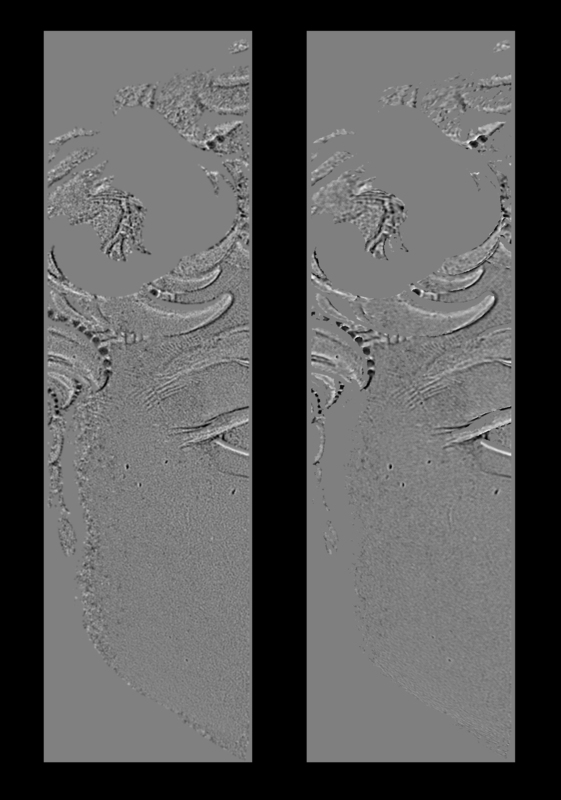 Rugis, J.: Extracting surface curvature from noisy scan data. pages 185-190, 2006. Great Barrier Island, New Zealand. Rugis, J. and R. Klette: A scale invariant surface curvature estimator. pages 138-147, 2006. Hsinchu, Taiwan. Rugis, J.: Projecting surface curvature maps. Conference DVD-ROM, 2006. Boston, USA. 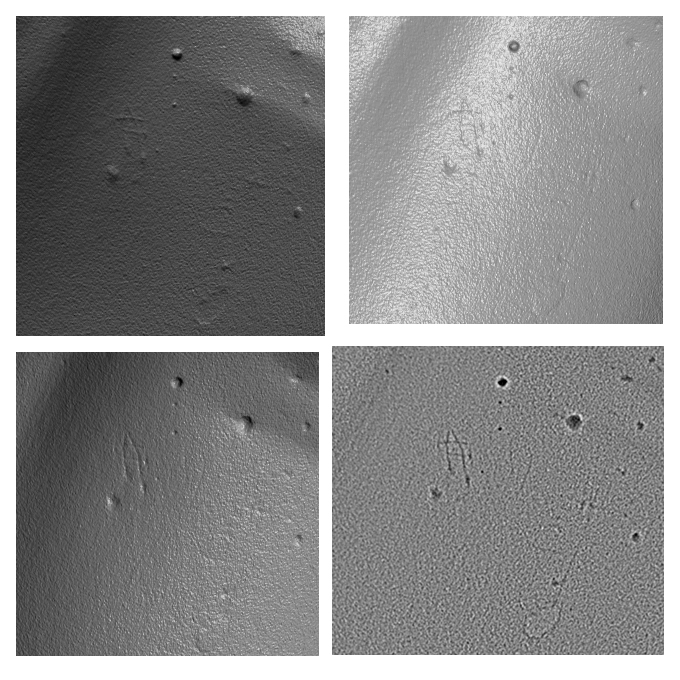 Rugis, J. and R. Klette: Surface registration markers from range scan data. pages 430-444, 2006. Berlin, Germany. CITR Seminar, University of Auckland, May 23, 2006. 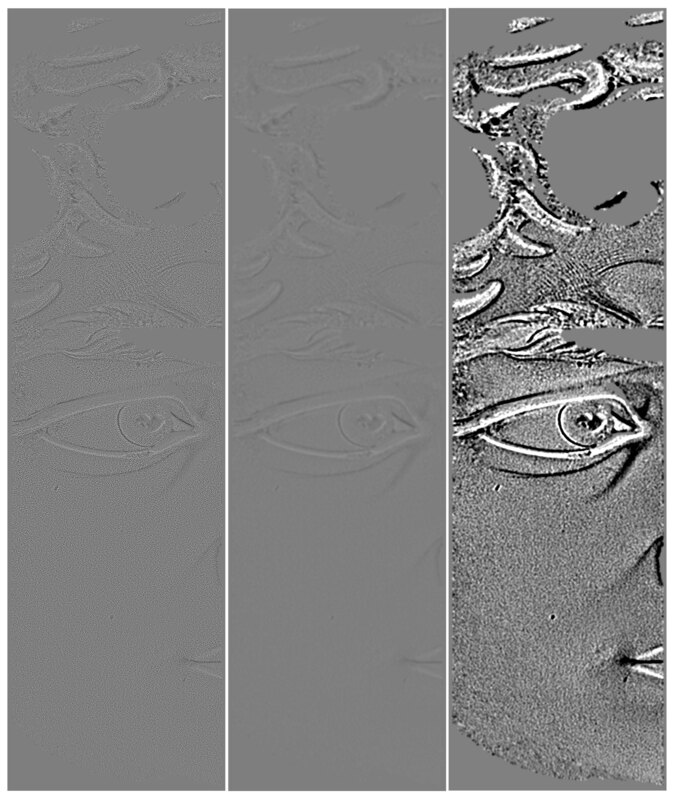 Rugis, J.: Surface curvature maps and Michelangelo’s David. pages 218–222, 2005. Dunedin, New Zealand. CITR Seminar, University of Auckland, October 25, 2005. 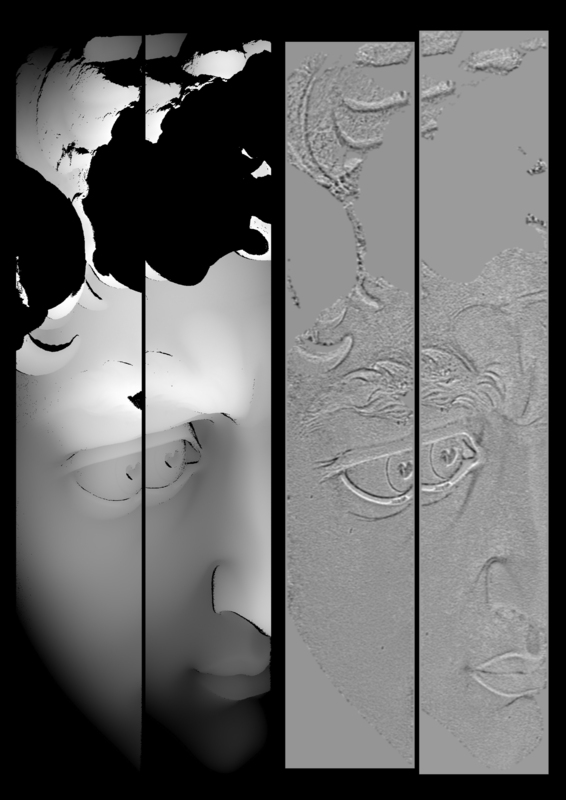 Rugis, J.: Curvature maps and the Digital Michelangelo Project. CITR Seminar, University of Auckland, October 15, 2005. Rugis, J.: Surface curvature from laser triangulation data. ECE Seminar, Manukau Institute of Technology, July 9, 2005. Rugis, J.: Non-mean curvature estimators. CITR Seminar, University of Auckland, June 10, 2005.